Eurostat has published the electricity and gas prices comparisons for consumers in EU countries, showing Portugal as the third most expensive despite low wages and high tax rates. Portugal is behind Belgium and Denmark for the high prices its consumers pay for electricity with half the cost shown on invoiced being for various additional fees and top-rate VAT. Portuguese consumers also pay the third highest price for gas supplies. “For the first time, Eurostat is publishing prices for electricity and natural gas that are fully comparable across countries” the European statistics office declared. In Portugal, electricity unit costs average about 24 cents, with the fees element accounting for 50% of costs - or 12 cents. Only Denmark do customers pay more fees, with 17 cents in every 27 cents on the bill. The price per kilowatt-hour fluctuates dramatically throughout Europe, from 10 cents in Bulgaria to 28 cents in Belgium. Portugal hit record consumption last weekend, August 4 and 5, due to the strong heat wave that hit the country and the need for full on air-conditioning to keep poorly insulated homes below boiling point. Portugal’s government claims to be working for the consumer to reduce electricity prices but much of the fee element of each bill is of its own making with support costs for EDP and VAT at the full rate, boosting charges to householders. An analysis in eco econews.pt. commented, "If we breakdown prices, we realise that families in Portugal have the second highest tax burden in Europe (12 cents per kilowatt-hour). This means that 52,02% of the price is tax-related. This value adds up to the debate regarding the reduction of the 23% tax on electricity, which has been on the table of discussions for the 2019 State Budget. 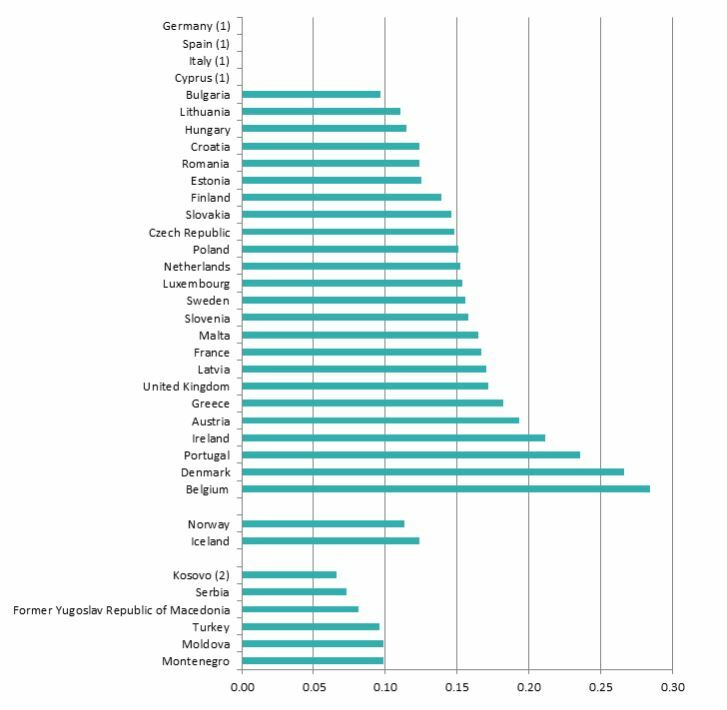 "Only Denmark presented a higher rate of tax burden reflected in the electricity price (17 cents per kilowatt-hour, or 65,33%) than Portugal. The European average stands at 28,94%, with Eurostat taking note that the variations on EU energy prices are reflective of different geopolitical situations, national energy mixes, network costs and weather conditions. "Gas prices reflect the same issue for the Portuguese, as only Sweden (11 cents) and Ireland (0,096 cents) have registered a higher tax burden than Portugal (0,093 cents). "In terms of natural gas prices indeed Sweden has a higher tax burden reflected in its price, but The Netherlands and Denmark also come before our country in terms of taxes weight alone. "Regarding this indicator, the number of countries who haven’t released data is higher: Germany, Spain, Italy, Cyprus, Malta, Finland, and Greece did not disclose information about their natural gas consumption prices. Romania, Bulgaria, and Hungary presented the most competitive natural gas prices in the region." CHANGING THE SUBJECT SLIGHTLY ;but nevertheless RIPOFF. We have a home in the beautiful Monchique mountains in a very remote area which has been devastated by this recent fire..However, we have been trying to get a PHONE installed which would have to be a satellite phone, and are consistently told we cannot have JUST a phone line we have to have the whole broadband package even though it is not possible to access broadband and no possibility of doing so in the near future.. Our nearest neighbours both have satellite phones but apparently the phone companies will not install them anymore as they are not cost effective.. We have zero network cover for mobile phones unless we climb the ridge behind the house even then it is weak but if we had had a landline phone we would have been able to raise emergency services at least 15 minutes earlier... Having been in direct path of this latest fire like many many others I will campaign against this RIPOFF policy.. A phone is NOT a luxury it is a LIFLINE for those living in remote areas. Winge over ..fight just beginning. Tooway offers Internet via satellite, there are various agents in Portugal. Not cheap pm + there's the cost of installation and equipment. If you can see the sky you can have Internet with this system and with Internet you can setup VOIP for telephone calls. article says "Portugal’s government claims to be working for the consumer"
well how about reducing the 23 percent iva rate to what is was before the "crise"
All countries with a lot of green energy as wind have high electricity prices. This article helpfully showing us the direct link to, and reason for, the current ERSE Electricity Regulator enquiry in the Lisbon Assembly. The new Chinese owners pocketing super profits that were never intended for them so must be stopped! This enquiry significant 2 weeks ago for a retired Energy Regulator effortlessly admitting neither he nor his staff were ever actually Regulating the Portuguese Energy market. "Political interference" he said - but we can assume his non-Regulation was agreed at his appointment interview !